Earth's atmosphere is chaotic, making it difficult for forecasters to predict weather more than 10-13 days in advance. However, research has increasingly shown that large-scale patterns of variability and relationships between states of the atmosphere in two faraway locations, called "teleconnections," can help extend prediction skill beyond this limit. "Few researchers have applied this mechanism to weather prediction," said Kai-Chih Tseng, atmospheric science graduate student at Colorado State University (CSU). "Especially from two weeks to three months, which has been known as a 'prediction desert' in the past." A new study led by Tseng says that teleconnections with certain phases of a recurring tropical rainfall pattern could extend predictions up to 20-25 days in advance. The study is co-authored by Assistant Professor Libby Barnes and Professor Eric Maloney, both in CSU's Department of Atmospheric Science. The authors' findings provide guidance on which tropical conditions might lead to improved forecasts beyond our current capability – and more time to prepare for extreme events. 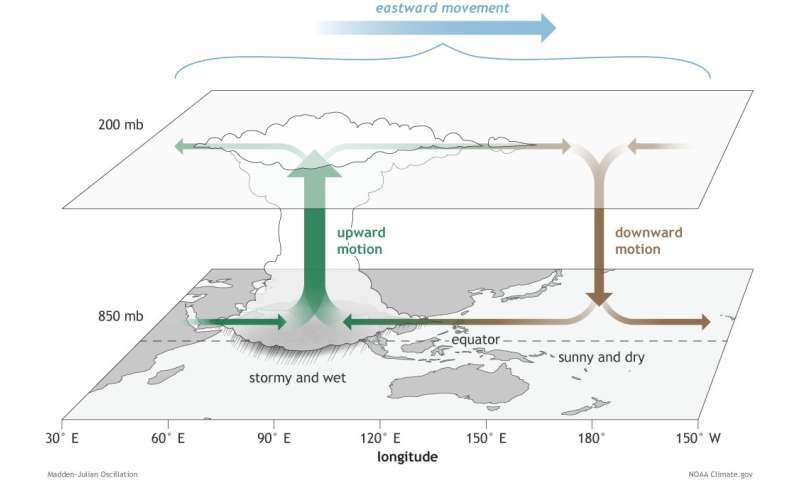 For decades, scientific evidence has confirmed that the major tropical rainfall pattern called the Madden-Julian Oscillation (MJO) can influence the weather in our neck of the woods. The MJO travels eastward around the equator, repeating its route every 40-50 days. Its global trek is divided into eight phases based on the MJO's location. As it moves, via interactions between the ocean and atmosphere, it sends ripples through the atmosphere that can contribute to extreme events in the U.S., like Arctic air outbreaks, extreme heat events, and flooding. Fortunately, the MJO's rotation period falls right within the prediction desert Tseng describes, between short-term weather and seasonal climate forecasts. Thus, its teleconnection with the mid-latitudes can support extended-range weather predictions. But understanding how our weather responds to the MJO is challenging. The MJO's ripples take time to spread to the mid-latitudes as it traverses the Earth. So, weather conditions we see in the U.S. may have been triggered by an earlier phase of the MJO. In addition, most previous studies evaluating MJO teleconnections used an averaging method that doesn't assess consistent patterns of how our weather responds to MJO events. Tseng and the team compared MJO events to each other to see how often they found similar patterns. "If a pattern shows up again and again, then we can confidently say, yes, this pattern is more predictable and is very likely to show up again in the future," Tseng said. The team found that MJO phases 2 and 6 in particular can generate consistent patterns of wind and pressure in the mid-latitudes. These strong teleconnections during certain phases improve prediction skill at extended lead times beyond weather by reducing uncertainty in forecast models. "We were surprised that certain MJO phases [2 and 6] produced more consistent teleconnection patterns," Tseng said. "It has been the perception that all phases of the MJO produced strong teleconnections." However, their results showed that the MJO's teleconnections were most consistent when the MJO was located over the east Indian Ocean or west Pacific. These findings could help provide more time to prepare for extreme events, compared with the traditional 10-13 day weather prediction limit. In the future, Tseng and his colleagues want to understand why the MJO teleconnections are consistent for certain phases. If they understand the mechanism, they might be able to determine how climate change may affect these teleconnections – potentially strengthening or weakening the response in the mid-latitudes. "If these teleconnections do change strength in future climate, it is possible that our weather prediction capability based on the MJO may also change," Tseng said. This looks like an ideal application for a deep learning AI engine. We are after all looking for correlated features with rather indeterminate rules.